The knife itself was good, fit great in the hand but a bit too light. However as hard as i tried it WOULD NOT fit into the sheath. Several Bowies i've gotten from here the sheaths have all been shoddy and of poor craftsmanship. Budk you really need to improve on this. Although i would recommend the blade itself. Very low quality. The blade was not at all what the picture showed and came out of the box with no blade. The blade is very thin and cheep, plus the finish on the blade starts coming off in a month of honest sheath wear. It took me hours to get any sort of blade on the knife. This was a rare let down for Budk. The knife I received had a 12" inch blade instead of advertised 13 3/8" blade. The blade is quite thin compared to what I expected and the knife seems extremely light for its size. 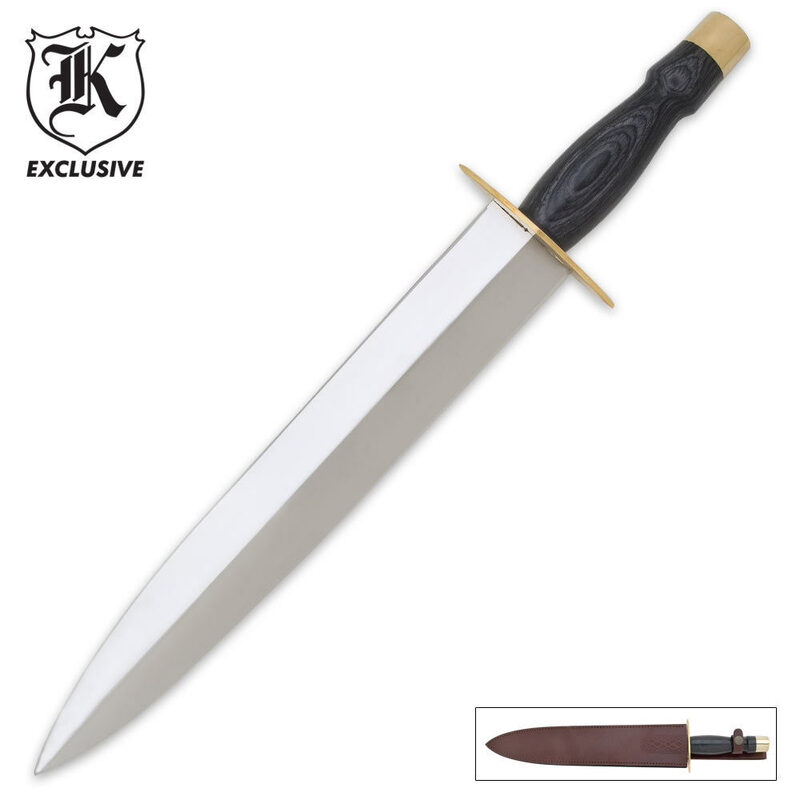 This knife is not suitable for heavy duty work but it is sharp and sufficient enough for self-defense as its pointy tip would make the blade optimal for stabbing. The sheath is decent, however it could be about 1/2 a centimeter longer since it does not fully engulf the entire blade. The blade is also straighter and triangle shaped than as pictured which shows the blade curving toward the point near the end. Overall I am not totally disappointed with this product as it still is a nice piece. A friend of mine and I both bought one of these. We were both pleased with its quality. Nice wood handle, sharp bladed, and nice brass fittings on the pommel and hand guard. AND A STEAL at the price!! Can't go wrong with this one! My knife is only 12 1/4 inches long and slightly less than 2 inches wide. It is probably 1/8" thick. I was disappointed not to get the 1 1/8 inches more length. If you want a fast and long knife, this is a good choice. If you want heavier duty, get a Timber Rattler renegade - almost as long and 1/4" thick. Nice for the money, but I much prefer my renegade. Scabbard is attractive and fits. Editor's Note: Thank you for your comments. We have updated the review to reflect the appropriate spelling. Blade is a little thin and the sheath doesn't fit the blade very well. That having been said it is a great value and the point is very sharp. the sheath fits great but the blade has more of a triangle shape than the knife pictured which is more curved towards the point.knife is massive but it would need more meat to make it functional. i also ordered the timber rattler custom bowie......not that is a functional knife with a shape blade for the price everyone should have one. "Outstanding value for the price!! Well constructed, very comfortable in the hand and reasonably sharp. Sheath could use an extra 1/2 but is otherwise well made.""" When it comes to big, bad and bold, this toothpick is hard to beat. From its' amazing 13 and 3/8's inch long blade that tapers from 3 inches wide to a perfect point to the handfilling grip with brass cap, it is hard to pass over. While fairly well sharpened as it comes, it is capable of being honed to a very fine edge one can shave with. The only detriment is the accompanying sheath which just does not house this monster blade. That is okay, I will make one for this beauty. For the price it is another excellent value from Bud K.